It’s a question that will be pondered for as long as there are political scientists and media analysts: What caused the rise of Donald Trump? In a story for Politico, former news anchor and correspondent Campbell Brown wrote that she blames television news for the success of Trump’s candidacy. This has been a common debate among people in the media over the last few months, as Trump gets closer to winning the Republican nomination. One theory put forward is that by simply giving Trump so much airtime, networks all but guaranteed he would be successful at the ballot box. 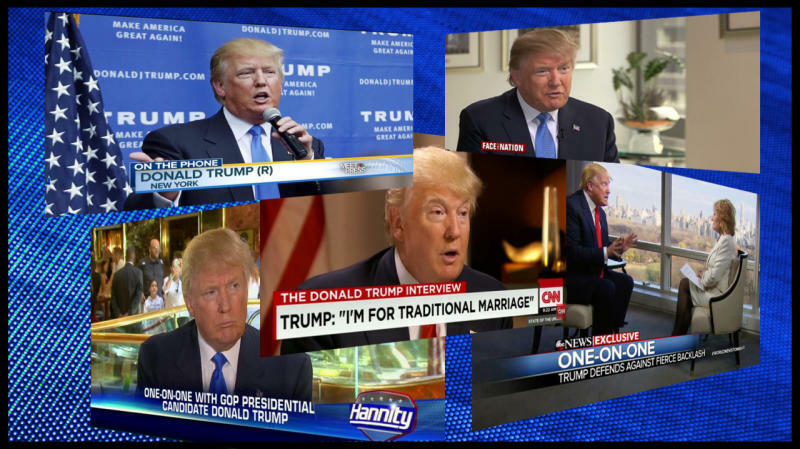 Data from the Internet Archive’s TV News Archive and analysis by Republican pollster Jan van Lohuizen and analytics expert Luke Thompson, Trump gets about six appearances on the major networks for roughly every one his rivals Ted Cruz or John Kasich get. In fact, Trump’s exposure has been three times greater than that of Cruz and Kasich combined. He received 50 percent of the exposure when there were more than a dozen candidates—a percentage that has only grown. Of course, by now, you’ve all also read the figure of close to $2 billion worth of free media the New York Times cited for Trump’s TV bonanza. And that story was back in March. No campaign’s advertising budget can compete. But consider the tone of the coverage at Trump’s debut. When he first declared his candidacy, a majority of airtime was spent calling him a joke candidate who had no shot. Then the headlines proclaimed him a racist after his comments that Mexico was sending rapists to the U.S. Then the media said he was toast because he insulted John McCain for being a prisoner of war and again buried his campaign for his comments regarding Megyn Kelly’s debate moderation and Carly Fiorina’s face. “Media-driven surges are not sustainable,” wrote the New York Times, stating that Trump’s support was about to take a dive. That was in July. It’s also important to note that on an average weeknight, Fox News, CNN and MSNBC are getting approximately 3 million viewers combined. When did those ratings spike? During the debates, when viewership for the Republican contests would consistently rise above 10 million. During the most-watched events of the 2016 cycle, Trump was not getting solo time to give his stump speech without question. Instead, he was sharing the stage with his rivals and generally taking tough questions from moderators. Going into every debate, it was easy to guess what would happen after the closing statements. Pundits would say Trump was out of his depth and didn’t fare well; they would praise one of his rivals (generally Marco Rubio) and say that this debate would be the turning point that would end the billionaire’s run at the top of the polls. For example, here is NBC News’ Chuck Todd pointing to a September debate performance as the probable beginning of the end of Trump 2016. Following a debate in South Carolina, Sen. Lindsey Graham predicted Republicans there would reject Trump’s anti-George W. Bush, pro-Vladimir Putin rhetoric. Instead, Trump won every delegate in Graham’s home state. In the senator’s defense, a majority of Politico’s GOP insiders said the same thing. An Atlantic story in February called Trump’s debate night “terrible,” and a few days later he won a majority of Super Tuesday states. There are many, many examples of people in the media saying a Trump debate performance was going to cost him, followed by it having no adverse effect, to the point that eventually the headlines started to read along the lines of, “Trump didn’t do that great, but it’s probably not going to matter,” such as in this February analysis from our own Jon Ward. While pundits declared Trump dead after these performances, viewers (and voters) crowned the real estate magnate the winner of each debate in nearly every online poll. You could see it in our own very unofficial Yahoo surveys, on Drudge Report or all over social media: People liked what Trump was saying, even as moderators and analysts said how poorly he had done. Much like at the ballot box, people who voted in post-debate preference polls generally went with Trump. Where the media may be at fault for the Trump phenomenon is in ignoring the fact that the candidate is only popular among a plurality of Republican primary voters. Blasting speeches in which he denigrates minorities, women, immigrants and his fellow candidates over the airwaves has had the effect you might think it would on a majority of the country. Over 63 percent of Americans have an unfavorable view of the Republican frontrunner, and in a March poll conducted by the Washington Post and ABC News, even a majority of voters who identified themselves as conservatives had a negative view of Trump. He is deeply unpopular among women and Hispanics, to name just two large constituencies that will be voting this November. But Trump isn’t popular among the people who vote for him simply because he’s on television more than his competitors. He’s popular with the people who vote for him because they like the platform on which he’s campaigning. A February poll of Republican voters in South Carolina found that 60 percent supported a ban on Muslims entering the United States, which seems like a lot until you see that 80 percent of those who planned to vote for Trump were in favor of the ban. These numbers were backed up by CBS News exit polling in the Palmetto State, which found that 75 percent of GOP voters wanted to bar Muslims from entering the country. A Pew Research Center study from March found that 69 percent of Trump supporters think immigrants are a burden on the country, while 67 percent think free trade is a bad thing. Voters back Trump not because they see him on TV a lot but because they feel like the Republican Party has betrayed them. In March, Yahoo News profiled a series of Trump supporters, and in hours of interviews, none of them said he had earned their vote by being on TV a lot. There are myriad reasons for Trump’s rise that will take years for people to unpack. Media — combined with his preexisting celebrity and name recognition — certainly played a role, but not quite as large of one as some in the industry are asserting. (One quote in Brown’s piece was, “At least this shows how much we still matter” — a very media thing to say considering that American trust in the industry is at a historical low.) It’s not Trump’s media exposure but his proposed plans for the country that make him extremely popular with a segment of American voters. And it’s those exact same positions — the ones he espouses on television, on Twitter and at his live events — that make him deeply, deeply unpopular with a significantly larger segment of the country.